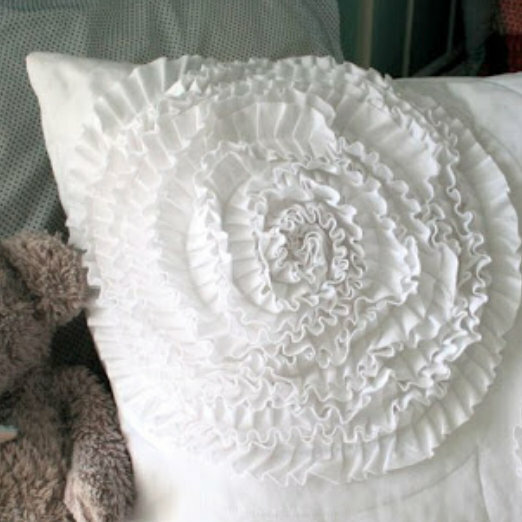 We are beyond thrilled that Larissa from mmmcrafts is here today with a fabulous West Elm ruffle pillow knock off tutorial! Hi, folks! I’m Larissa Holland of mmmcrafts and I like to make stuff and drink coffee. A lot. I’m a graphic designer turned home-schooling mom, and being creative really helps* to keep me sane. 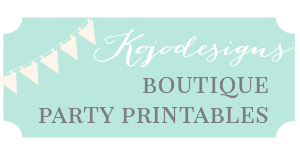 I have a shop where I sell my sewing and papercut patterns and the occasional finished piece. 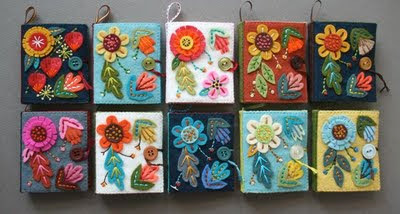 You can find a wide variety of crafts on my blog. I like to try new things, but I mainly squander large amounts of free time on papercuts, cards, felt crafts, and of course sewing clothing, accessories and gifts. In some instances, I think good design is just worth paying for. 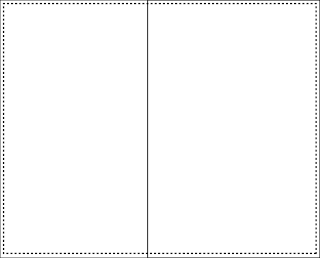 For me, the price/value is on a sliding scale with ease/cost of replication. 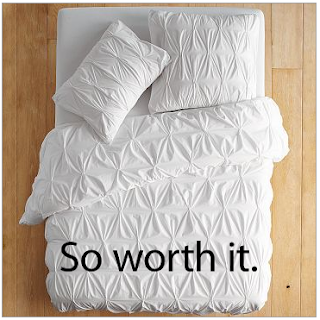 For example, I recently purchased this Pintuck duvet cover for our bedroom from West Elm. 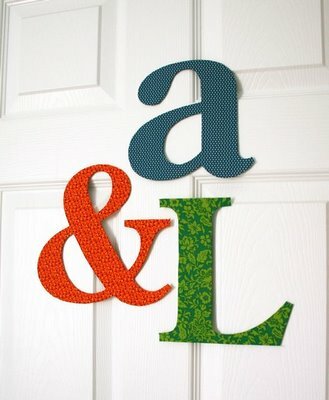 I love and adore it, and just thinking about trying to make something similar to it gave me hives. It was easily worth the purchase price. 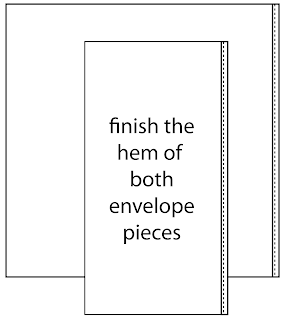 I pressed the edges of the two envelope back pieces over half an inch, then another half an inch and sewed it down to create a finished edge. I set them aside. 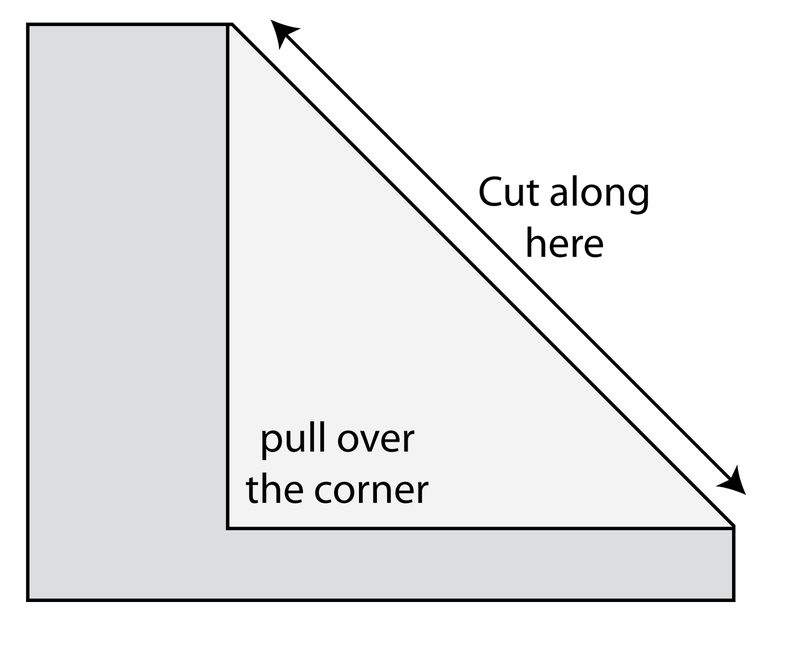 Then I cut along that fold. 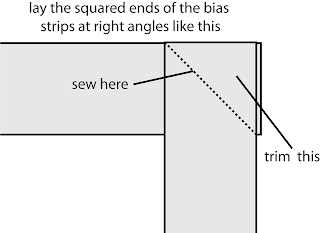 This new cut edge was on the bias. 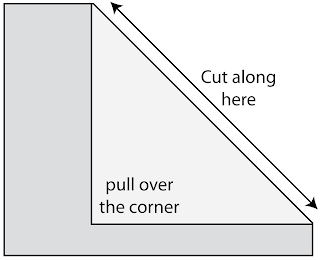 Then I cut 2 inch strips from those bias edges until I had what looked like a really ridiculous amount. Turns out 225 inches was not even enough to complete the larger ruffle circle, so I had to cut more. 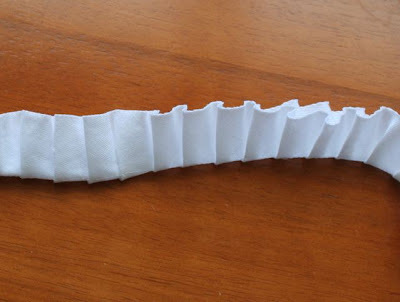 (How much you need may vary depending on how tightly you ruffle the strips, but more about that in a minute.) I figured 2 inches wide would allow for the strips to fray a bit in the wash and still look fluffy. 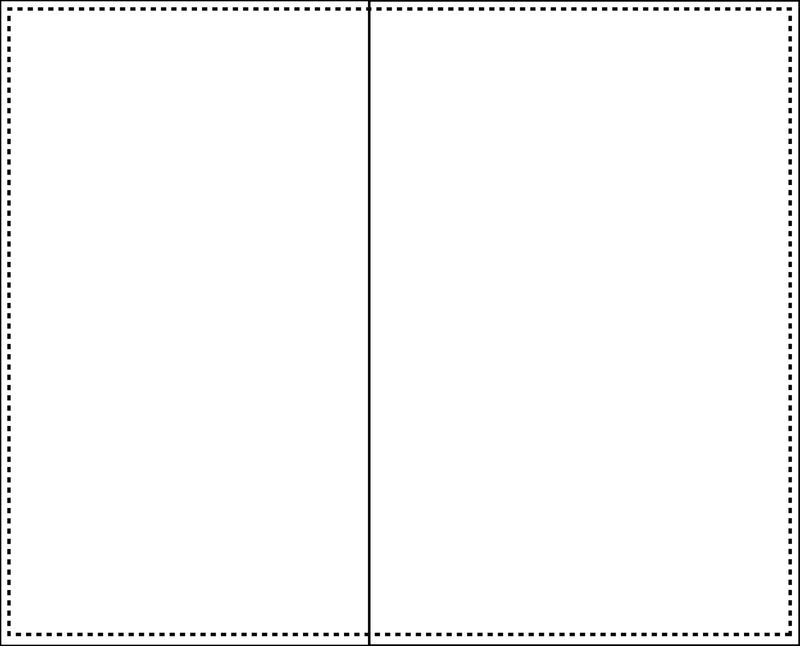 If you look closely at the West Elm photos, I’m pretty sure their strips were not that wide. You can vary it as you like. Ok. This is where your results may vary. I used my ruffler attachment to gather the strips. 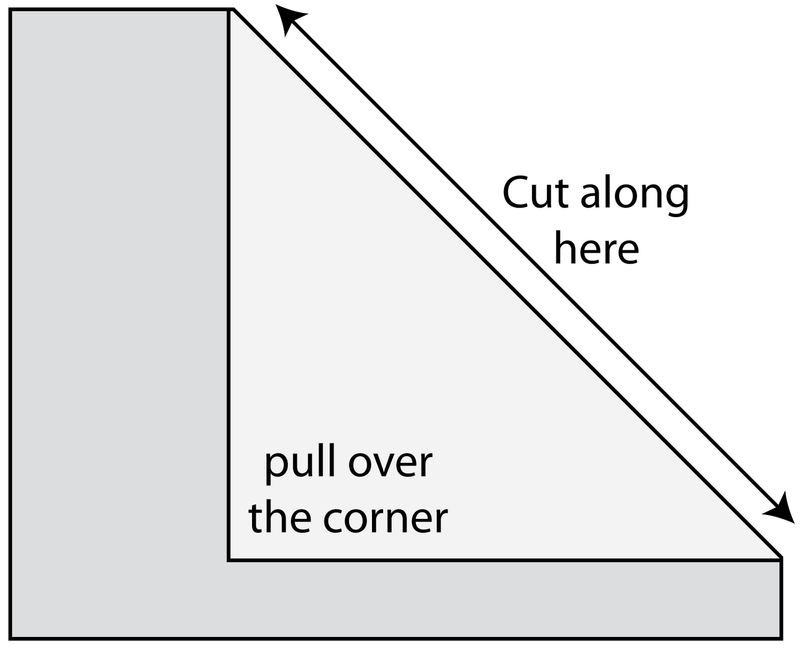 I didn’t want to hand gather a strip that long because, well, I hate gathering. With every fiber of my being. If you have a ruffler attachment, by all means dust it off and put it on. This is where it shines, man. I used a stitch length of 2.5 and the 6 setting on the ruffler (meaning a tuck is taken every 6 stitches). Then I just fed the strip through and watched it do all the pretty tucks for me. One thing you want to keep an eye on is the needle itself. 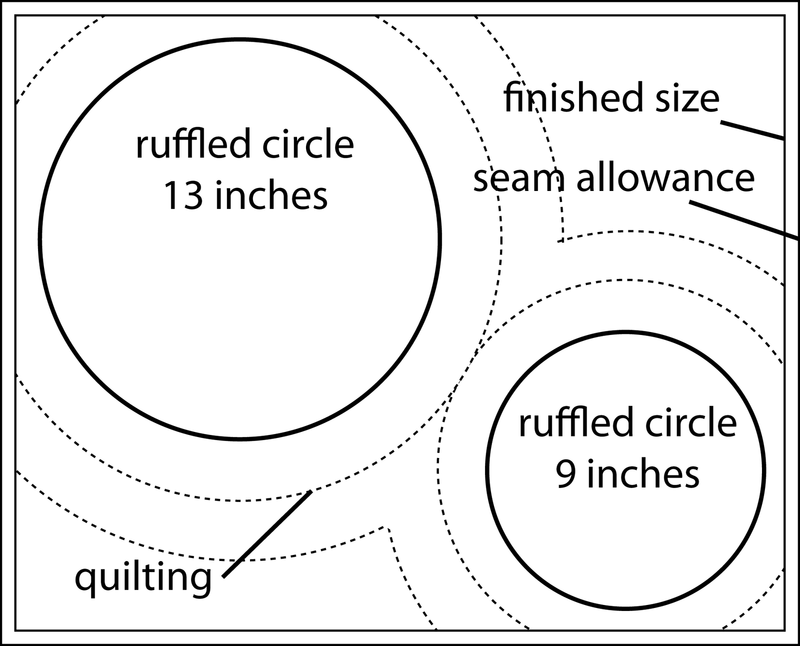 It can work loose after a little while from the action of the ruffler and you don’t want it to fall out mid-stitch. Like I did. 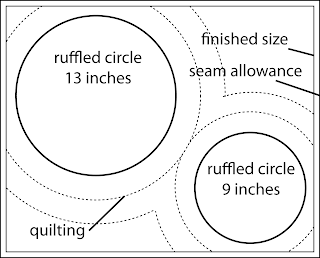 So you don’t have a ruffler? You can cheat too. 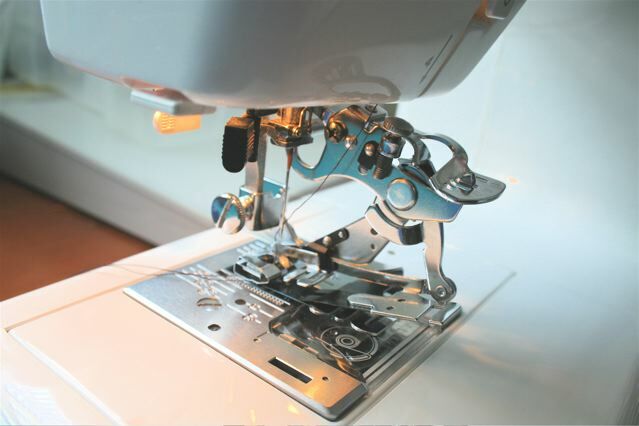 You can use a gathering foot, or if you don’t have one of those you can experiment on a test strip by increasing your stitch length and tightening the tension until your machine is making gathers by itself as you sew. 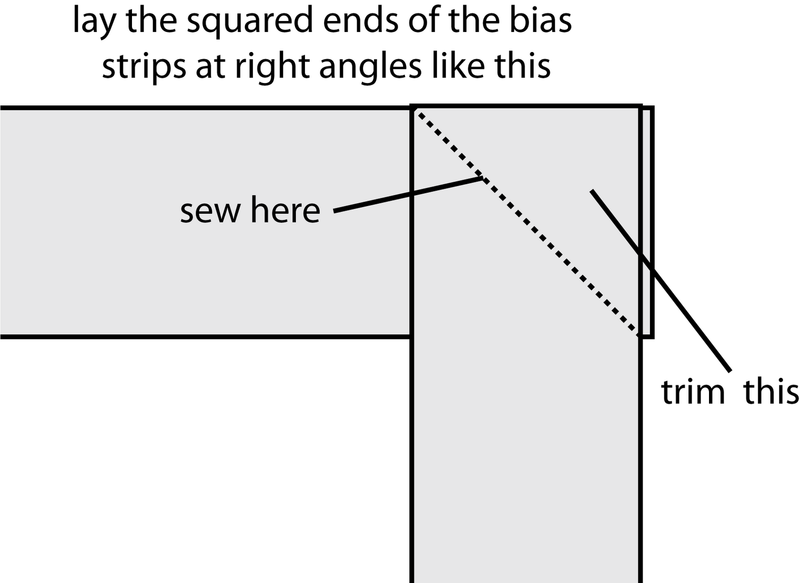 It will really help if your bias strips are a lightweight fabric. After ruffling all the strips I pressed them in half along the seam. 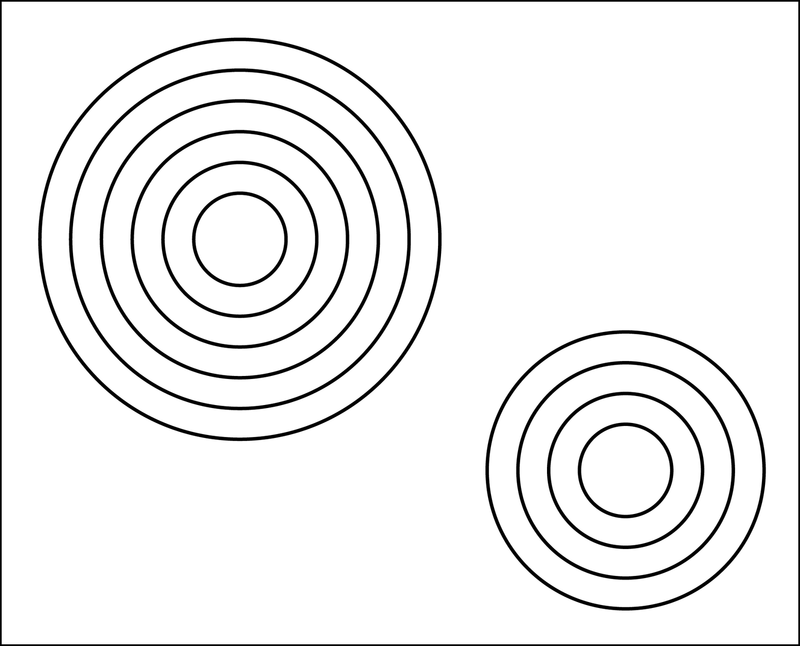 Each nested circle is an inch apart from the next. Then I also drew in my quilting lines with an air soluble marker. I sandwiched the batting between the sham top and the sham top backing, pinned (a lot), and sewed along the quilting lines only, working from the center outward. 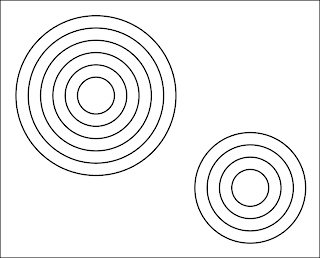 (Do not sew the concentric circles). 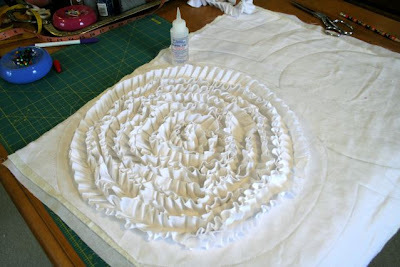 I used fabric glue to tack down the center seams of the ruffled strips to the concentric circles. Beginning with a tight circle in the center, I worked my way around and outward. I tucked the end under when I completed the circle. 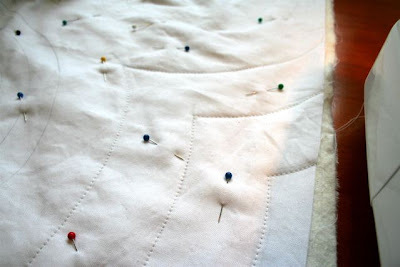 Then I used the machine to stitch each ruffled circle in place. Now to put it all together. First I squared up the sham top. 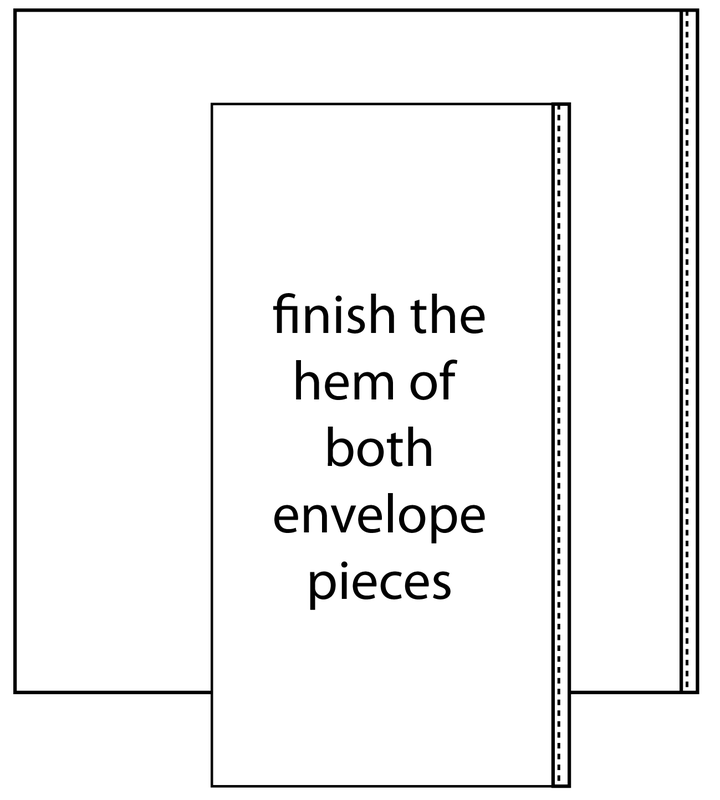 Then I aligned the envelope back pieces right sides together to the sham top and pinned. Using a half inch seam, I sewed all the way around. 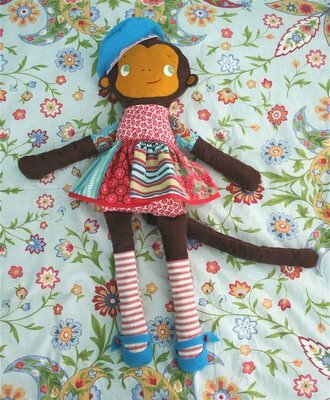 Lastly I snipped the corners, turned it, stuffed it with a pillow and viola! The West Elmish look I wanted for her new bed. I have to say, after making this sham with the 14 miles of bias strip to ruffle, the WE version looked a lot more attractive, and according to my sliding scale I think the $30+shipping they want for their sham is a pretty fair deal. But having said that, the one I made still wins with me because 1) it’s the style/exact color I wanted, 2) I was able to make it from my stash in more durable fabric for zero dollars, 3) it is something special from her mom that my daughter loves! Be sure to go check out some other lovelies at mmmcrafts. Larissa has a great eye for color (love the needle books she’s been making for her shop lately- though it looks like they’re all snatched up! 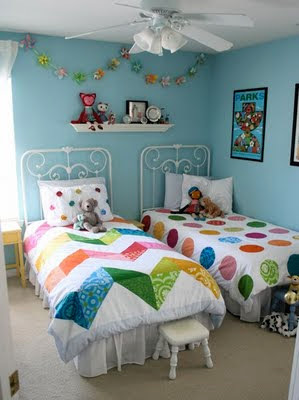 ), has such fantastic decorating style (check out the duvet covers she just finished up, as well as her fabric covered letters), and makes some seriously fabulous kid’s stuff (she had me at “Molly Monkey”). Don’t forget to check out Knock Off Decor, the sponsor of The Sincerest Form of Flattery series. There is all sorts of knock off fabulousness! My word, thanks for the glowing intro! Y'all are sweet. Larissa: What a lot of hard work you put into your pillow, but I love it and I think it is SO much prettier than the West Elm pillow. Great job! I absolutely MUST get myself a ruffler. And I think her version wins over the WE version as well. It's SOOO beautiful. That came out really nice and I LOVE the diagrams! Thanks for the how-to, I'll be linking. Beautiful work! I just adore pillows with special character! Ah..I have the same West Elm bedding in Natural. I LOVE LOVE LOVE it still after 4 years. It is one I will never tire of and I too am all about great design. 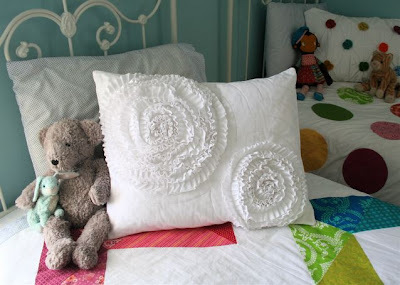 I will be linking your pillow DIY tutorial through my blog later today! I actually like the handmade ruffle pillow much better!!! Gorgeous! 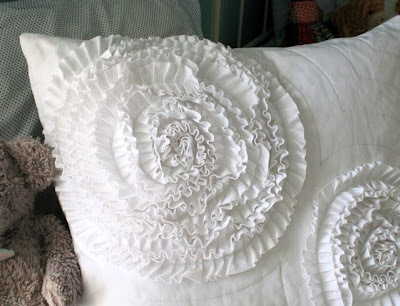 I like the way you offset your circles much better than the West Elm pillow! I love your version much better! 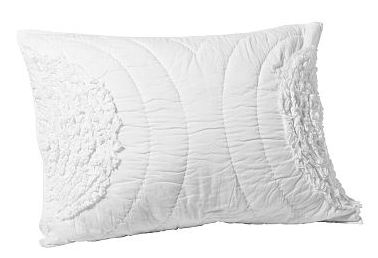 This has to be the most beautiful pillow I have ever seen. I love your version so much better than the inspiration piece. Thank you for the tutorial. 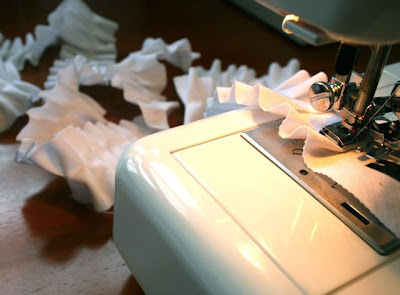 I am curious, how did you go about machine sewing the fabric down after you glued in place?